The Big Little Lies Season 2 trailer has arrived. Reese Witherspoon and some other members of the star-studded cast posted the trailer on social media to coincide with the release of the mighty Game of Thrones Season 8 premiere over the weekend. The addition of a second season wasn't exactly the greatest news for fans of the first installment since it told and finished the story of the novel of the same name by Liane Moriarty. Season 1 completed the story, so where do they go from here? While fans of Big Little Lies weren't exactly happy about the announcement of a second season, things turned around when it was revealed iconic actress Meryl Streep had joined the cast. Streep joins fellow Academy Award winners Nicole Kidman, Reese Witherspoon, along with Shailene Woodley, Zoe Kravitz, and Laura Dern. 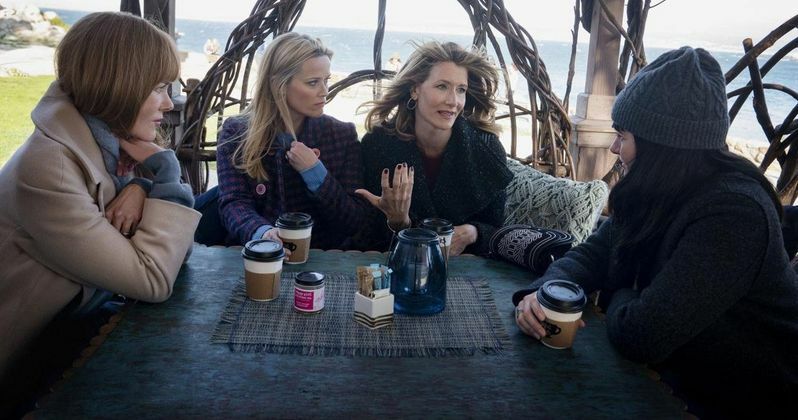 HBO promises Big Little Lies Season 2 will "continue to explore the malignancy of lies, the durability of friendships, the fragility of marriage and, of course, the vicious ferocity of sound parenting." As for the decision to move forward with Big Little Lies Season 2, HBO boss Bob Greenblatt says it wasn't an easy one to make. Producers and the network all wanted to return, but didn't know if they should mess with the series that swept the 2017 Emmys. In the end, they decided to go on with Season 2 and Greenblatt assures fans they will enjoy the upcoming season. He had this to say. "I loved the conclusion of that first story. It felt like you could walk away (then) and be really satisfied. And yet, I was thrilled when I heard that this cast was coming back together with this creative team. And, oh, by the way, Meryl Streep is coming on board." Bringing Big Little Lies Season 2 together meant original author Liane Moriarty had to come back on board. She ended up writing a novella, which led to original showrunner David E. Kelley coming back on board to create the new story arc for the series. After reading what Moriarty and Kelley had done, "it was undeniable," says HBO programming boss Casey Bloys. All of the actresses loved being involved in the storytelling and coming together as a family, so it was an easy choice for them to make. Big Little Lies Season 2 debuts June 9th, exclusively on HBO. It seems fans of the first installment are starting to come around to get excited about what the Monterey 5 are going to be up against this season. Meryl Streep is playing the mother of Alexander Skarsgard's Perry Wright character, and she is out looking for answers. As HBO promises, "things are going to get messy." Streep looks intense in her first small screen role in 15 years. You can check out the Big Little Lies Season 2 trailer below, thanks to the HBO YouTube channel.